When it comes to eSports, you've got the NASL, MLG, GSL, and now the IPL. Professional StarCraft 2 has a new acronym, and it stands for IGN Pro League, IGN's (yes, that IGN) new StarCraft 2 league. Unlike the other major pro leagues, the IGN is relatively small right now--16 players are playing through a double-elimination tournament bracket for a $2500 first place prize. The tournament will run over the next week, with the grand finals match planned for May 1st. The first game day of the season started on April 21st at 5pm Pacific--check the official announcement and bracket for more details--and community favorites DJWheat, TotalBiscuit, HDStarcraft, and LGPainUser will be announcing the games. The tournament's called "The Best of the West" for a reason (no Korean players here, folks) but you'll still find plenty of great players contending for big money, including ROOTCatZ (Zerg) and ROOTKiWiKaKi, FnaticMSITT1 (Protoss), and the SC2 bad boy EGIdrA (Zerg). Thankfully, the IPL is completely free to watch, whether live or via video-on-demand, and you check it out for yourself here. 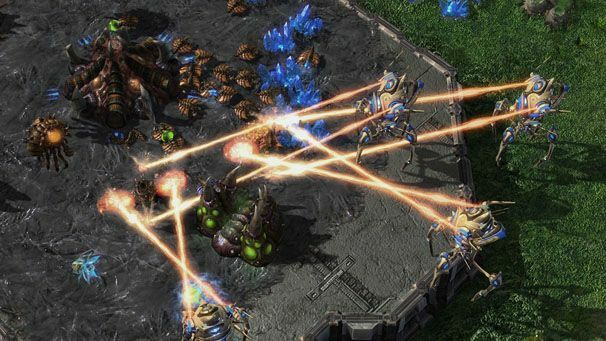 The GSL is back in the swing of things, starting with the first day of Code A and Code S play at the beginning of the week. They've reverted to the season ticket pricing model, so you can watch the free low-quality stream live, but you'll have to pay $10 for an ad-supported ticket or $20 for an ad-free ticket if you want high-quality video feeds and video-on-demand access. Tonight's matches feature Code S players LiquidJinro (Terran), NSHoSeo_san (Protoss), former champion IMNesTea (Zerg), season 1 champion TSL_FruitDealer (Zerg), and several other high-caliber players duking it out in their round of 32 group play matches. Also, look forward to ST_July (Zerg), TSL_Trickster (Protoss), and LiquidHuk (Protoss) playing on Sunday. The North American Star League got off to a rough start early last week, with a handful of its more vocal viewers criticizing the stream and casting quality. Add production errors, like playing the pre-recorded game replays out of order, and they've got their work cut out for them. Nevertheless, they're keeping up their rigorous five-days-a-week broadcasting schedule (6pm Pacific, Tues/Wed/Thurs/Sat/Sun), with a good selection of can't-miss games coming up. Don't miss: ST.Ace vs. coLstalife and LiquidRet vs. oGsMC (Saturday) and EGIdrA vs. Cloud and BoxeR vs. Sen (Sunday, 4/24).